Wallpaper looks better and adheres to the wall better when it goes BEHIND elements like light fixtures, towel bars, and this thermostat. Sorry I didn’t get pictures of the “during” phase. 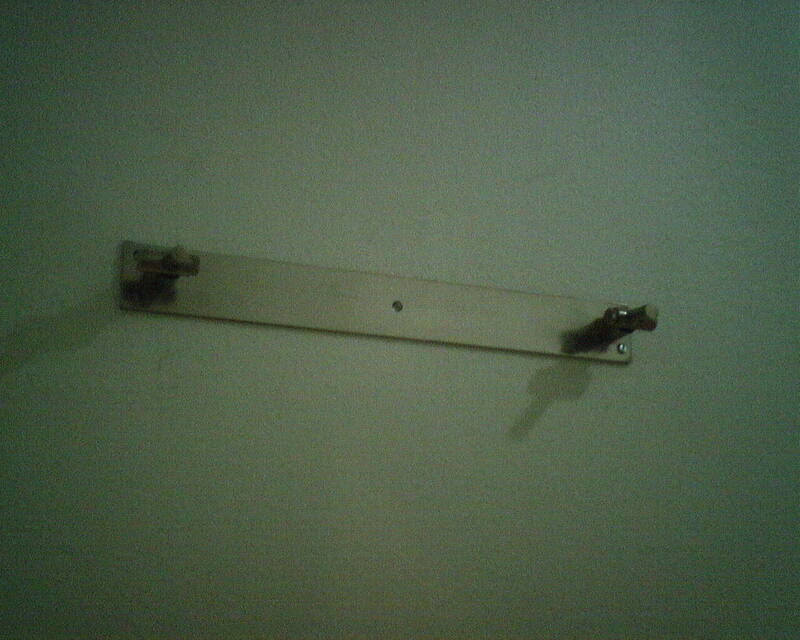 But what I did was to detach the thermostat from its mounting base. Then I unscrewed the mounting base and removed it from the wall. Everything was still attached via the electrical wires which ran into the wall, and the air conditioner still functioned. 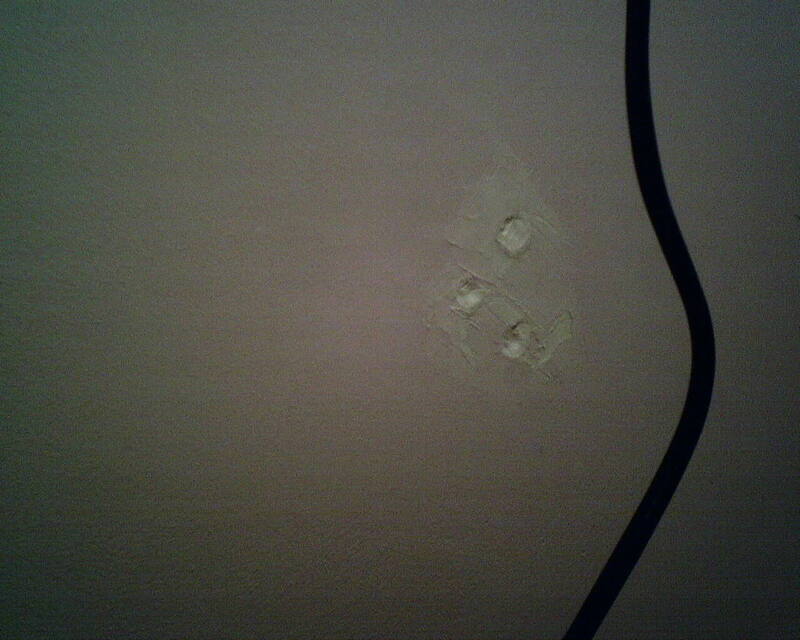 I was able to wallpaper up to the 1/2″ round hole where the wires came out of the wall. When I replaced the mounting base and thermostat, the hole was completely hidden, and there were no cut edges showing around the fixture. This also means that if the homeowners ever get a new thermostat, it will easily cover that small hole. 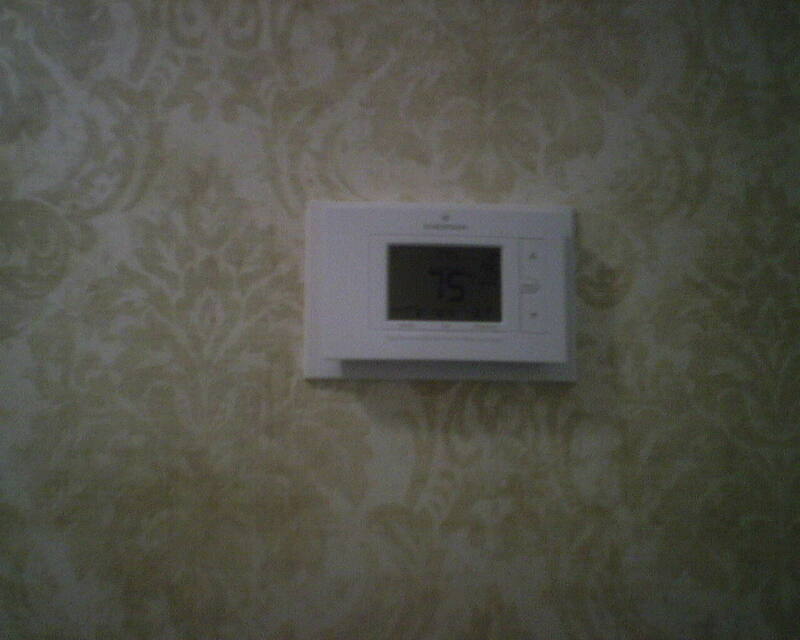 If I had left the thermostat in place and cut around it, there would be a large hole in the wallpaper, and the new thermostat might not hide it, so the homeowners would be faced with replacing the entire wall of wallpaper. The way I did it took more time, but it looks neater, is more secure, and disguises more. It’s not uncommon for me to work in a house where no one is home. In these cases, I’ll ask the homeowners to clarify for me which fixtures they intend to reuse, and which they want to get rid of. 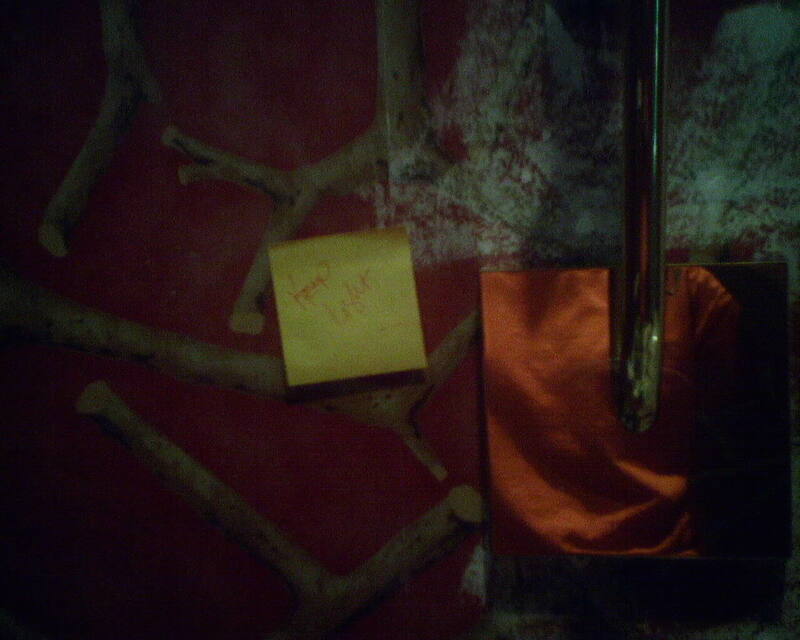 Here you see where the homeowner has left me Sticky Notes to let me know that they want to reuse the toilet paper holder, light sconces, and hanger for the mirror, but they do not want to keep certain other fixtures. This tells me which attachment brackets I can remove from the wall and then fill in the holes, and cover with the new wallpaper, with nary a trace of the old bracket to be seen. The other fixtures I will remove – and that usually includes removing the attachment brackets, too – and then, once the new wallpaper is in place, I will replace the mounting hardware and then reinstall the fixtures (towel bars, toilet paper holder, artwork, light fixtures, etc.). It’s easy – just let me know which fixtures you plan to reuse, and which you want to trash. It’s best to take accessories off the wall before installing the wallpaper, so that the wallpaper can go behind them, and leave a smooth, uniform look. “Accessories” can mean anything from light switch plate covers to towel bars to light fixtures to artwork to, as in this case, mirrors. This mirror (not shown) was supported by a bracket that held it a few inches away from the wall, and allowed it to swivel up and down. I had not seen one like this before, so it was interesting to me to figure out how it worked and how to get the mirror off the wall – and then back onto the wall, after the wallpaper was up. This mirror was affixed with “female” mounting receptacles that fit over the “male” rods protruding from the bracket on the wall. Then there was a largish hex-shaped set screw that fit into the top and joined the rod and the receptacle together and held them tight – with the help of an allen wrench. Now the apparatus is ready to support a heavy, framed mirror. Today I stripped wallpaper off a 2-room bathroom in Katy (Houston). There were several layers of paper underneath, and it was fun to see the changes the room had been through. Well, actually, in this case, three of the four papers were very similar, and brightly-colored with playful designs, so it appears the homeowners were shooting for a fun, colorful bathroom for their children. 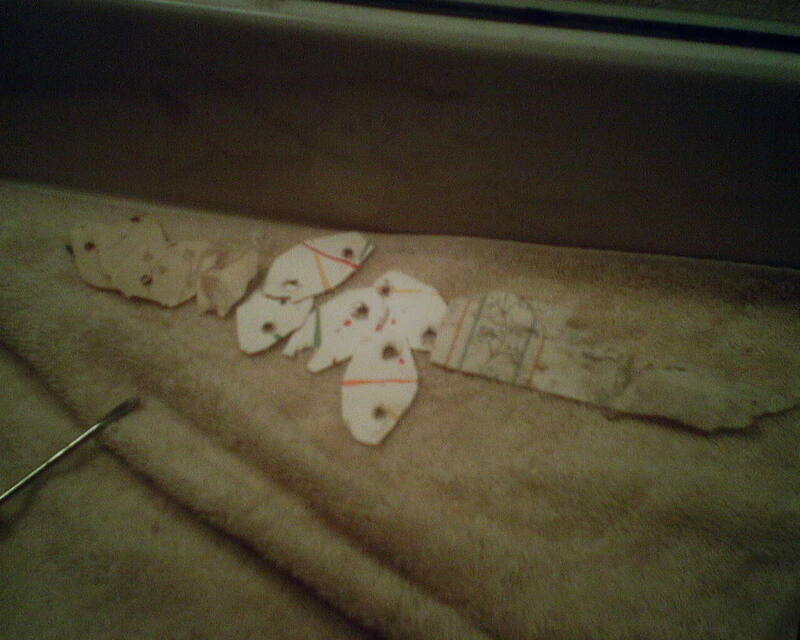 Scraps of the previous papers were found under the brackets for the towel bars, and one was lying on top of some decorative molding around the light box / fur down. 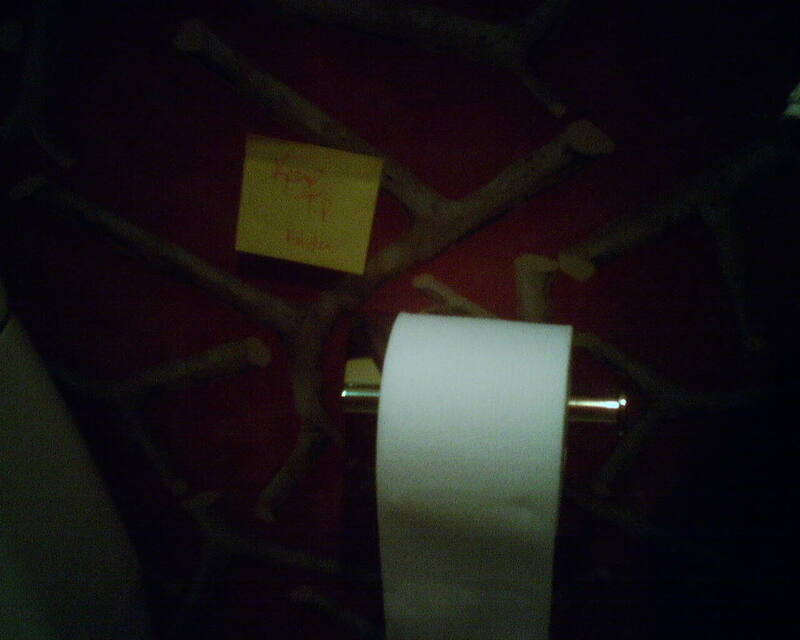 The first choice was a pretty bland tan paper with tiny brown leaves and vines on it. After that, the parents went for primary colors in splashes, and then in stripes. At some point, there were primary colors in a skinny stripe with diminutive flowers. These four papers reflect not just the homeowners’ taste and vision for the room, but the styles that were prevalent at the time each paper went up. In this Rice University area powder room, the original towel bars were not going to be replaced. So someone (I suspect the homeowner) removed them, and then attempted to fill in the holes left from the hardware. What people don’t realize, though, is that, even though the holes have been filled in, there are still dents, and also ridges from the gummy material used, that will all show under the new wallpaper. So I “floated” joint compound (kind of like plaster) over the area, let dry, and then sanded until smooth. The second photo shows after this work has been done – a nice, smooth surface that will be invisible under the new wallpaper. 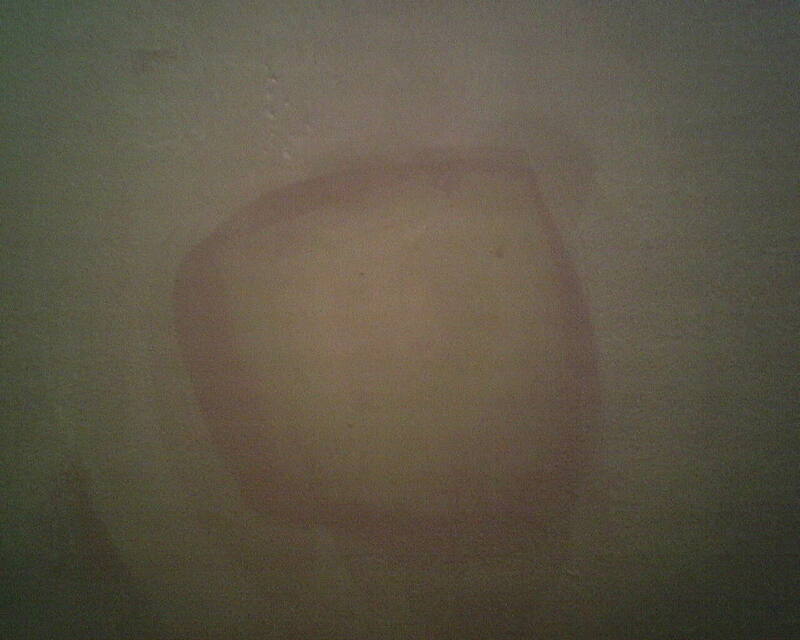 The walls were originally a lilac color. 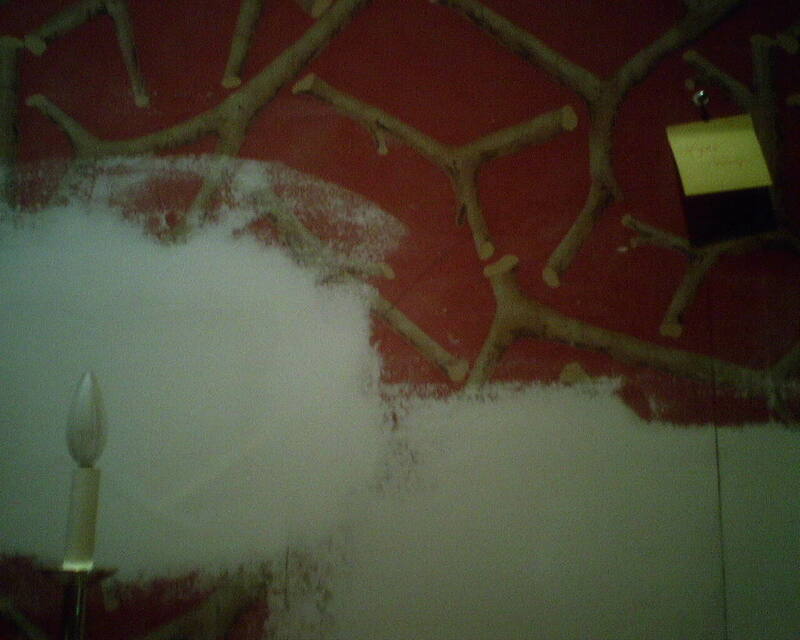 I primed with a thin white wallpaper primer, which you can see in the second photo. Then I applied my patching compound. The material I use to patch works better with a different primer, which is clear, so that’s why you see a little color difference, and a little of the lilac paint still showing. 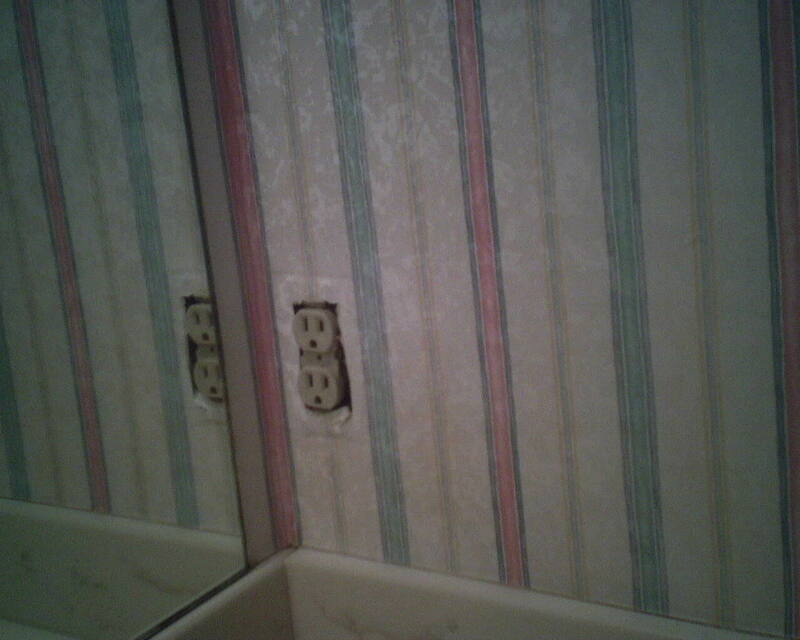 Don’t worry – none of this showed through the new wallpaper.